I’m still feeling sick with a cold, I need some comfort, my Pana chocolate supply is running low and I can’t be bothered getting dressed to face the world. I’ve decided to make a cake to cheer myself up. I was never much of a cake maker before I became vegan, but I thought I’d give it a go today. The lack of baking isn’t because I don’t like sweet things, I do. But when confronted with sweet vs savoury choice, savoury would win nine times out of ten. I think my first vegan baking effort turned out well. Well, not to be modest better than well. 🙂 It is quite light. 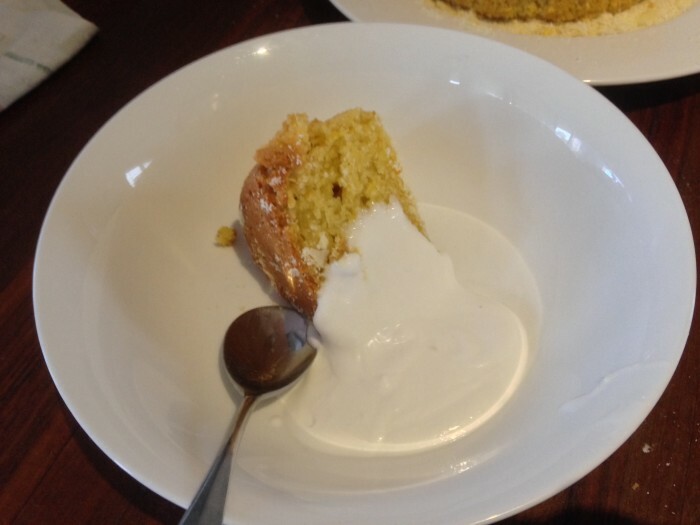 I like my cakes a little on the denser side so I think it could be even better for me with extra almond meal or polenta replacing a quarter of a cup of the flour. 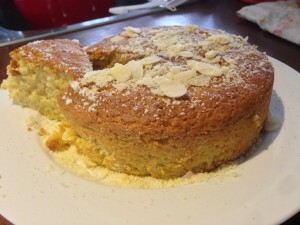 It is an orange and olive oil cake of the ‘chuck-it-in-and-mix-it-all-up’ variety. The recipe doesn’t really come from anywhere in particular but it is a combination of a standard cake recipe, with the dairy and eggs removed, mixed with an oil based muffin technique. I just sort of made it up as I went along. I wanted to use a cup of orange juice, but didn’t have enough oranges to make a cup, so I topped it up with lemon juice and some home made coconut yogurt. Oil an 8 inch springform pan and cover the bottom with baking paper. Pour into the pan and bake for 50 minutes. Check and see if a skewer inserted comes out clean. If not give it another 10 minutes and check again. Remove from the oven when done. Run a knife around the edge of the pan. Leave for 5 minutes. Release the springform and invert onto a cooling rack. I decorated mine with some toasted flaked almonds. I wanted to let your readers know that I was lucky enough to try a piece of this cake last night and it was delicious. Glad you liked it. I think it was still good even after 2 days!